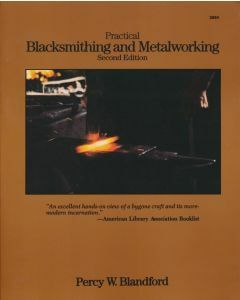 Practical Blacksmithing and Metalworking Blandford, Percy W.
* use forges and anvils, bellows, swage blocks and mandrels, tongs, and many other tools * work with sheet alloys, iron and steel, zinc, brass, tin, bronze, lead, aluminum, copper, and precious metals. * cut, shape, form, bend, solder, braze, weld, rivet, harden, anneal, flatten, punch, draw out, twist, split, loop scroll, saw, shear, file, drill, hollow-out, planish, mold, and cast all types of metals. * make chains and hardware such as nails, catches, bolts, handles, hinges, hooks, and latches. * create tools like punches, spikes, chisels, crowbars, tongs, hammers, sets, fullers, swages, and stakes. * make built-up assemblies. * apply geometry to the construction of trays, funnels, boxes, cylinders, and more! Percy W. Blandford is an internationally recognized master craftsman. He is a full-time freelance journalist and Fellow to the Institute of Journalists, and the author of more than eighty books. What's fun, easy, and conbe done by anyone? Welding! That's right, your're going to find that playing with metal using a MIG welder is almost as easy as wielding a glue gun. 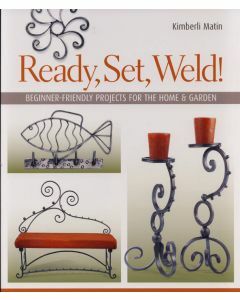 Matin covers the basics and gives you 25 step-by-step projects for the home and garden.